152.5 x 64 x 77.3 in. PRECISION-ENGINEERED HANDLING The specific Dynamic Power Steering (DPS) system is tuned for utility applications while also offering responsiveness for recreational usage. DPS improves steering feel in slow-speed working situations and in more technical terrain. It also is designed to offer less assistance at high speed and more assistance at low speed. BETTER CONTROL The Visco-Lok QE† front differential combined with the lockable rear differential offer a 4-mode traction system providing multiple choices for varying terrain or tasks. Users, via a separate front-and-rear toggle switches, can select between a 2x4 open rear differential for tight turning and turf protection, a 2x4 lockable rear for improved 2WD traction, a 4x4 open rear for more maneuverability in rugged terrain and a 4x4 locked rear for maximum traction. The rear differential is gear-on-gear to the transmission for better response, no maintenance, better efficiency and fewer components. PICK-UP INSPIRED SEATING The Dual VERSA-PRO bench seats offered on the XT package includes a truck-like flip-up passenger seats with a front sealed/waterproof under seat storage. It uses a reinforced seat cover with thicker vinyl and a special material finish to be more resistant and offer a premium look. The Defender MAX vehicles’ high-quality seat cover is designed to endure the everyday use on the farm, job site and trail. In addition, the XT driver seat features 3-in (8 cm) of adjustability (forward/rearward) for added comfort and better entrance / exit. ADAPTABLE STORAGE The open dash design features a handy removable and water-resistant 1.7 gal (6.3 L) toolbox, an industry exclusive, to allow users to carefully carry tools and supplies their need in an organized manner. In addition, it includes 6 gal (23 L) of under dash storage with an enclosed pocket, perfect for stowing small essentials. Combined with the removable and waterproof under seat storage box, the Defender MAX proposes a total of 16.9 gal. (63.9 L) of storage solutions. CAB-READY The sturdy Profile cage (steel) is designed in tandem with the Can-Am Cab and genuine accessories to ensure the best fit-and-finish and seamless integration in the industry. To enhance visibility and improve entrance / exit of the cab, the front section of the cage was moved far forward. 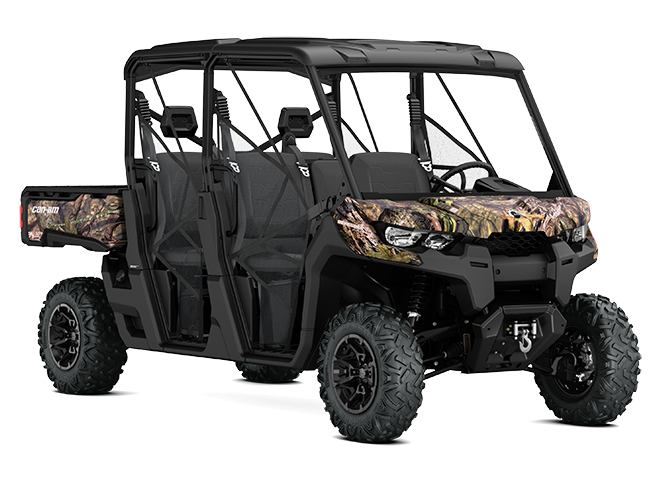 PAINTED OR CAMO The Defender MAX XT vehicles are available with premium metallic paint or an exclusive water-dipped camouflage pattern, providing a first-class appearance. Choose from the painted Intense Red or Pure Magnesium Metallic or go stealth with the available Mossy Oak Break-Up Country Camo.